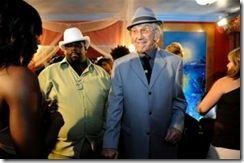 The 85-year-old former “Tonight Show” sidekick will star in two viral rap videos for FreeCreditReport.com, a financial Web site owned by credit bureau Experian. The videos feature McMahon wearing a tracksuit, being chauffeured around Los Angeles in a Cadillac Escalade golf cart and waxing lyrical about his very public financial troubles. We’ve seen the FreeCreditReport commercials where Eric Violette dresses up like a pirate in a seafood restaurant, rolls around in a used subcompact, marries his dreamgirl, and rides around on a bicycle. Here’s to hoping McMahon’s rap skillz measure up, son. Heeeeeeeeeeeeeeeeeeeeeeeeeeeeere’s Money.